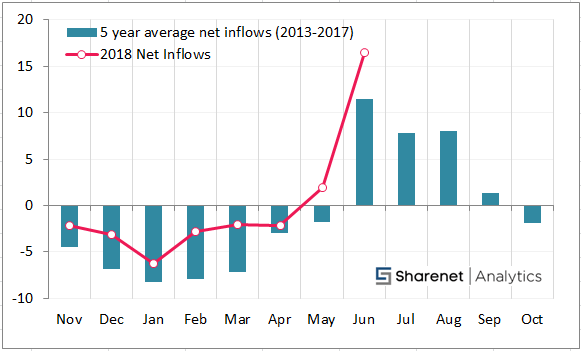 The drought situation has eased greatly over the last three weeks although restoring ground water and dam levels is inevitably a long process after such a prolonged drought. The following table illustrates the three week improvement and, even more significantly, the favourable comparison with last year. Figure 1. Dam Levels in the Western Cape as a Percentage of Capacity. The final figure shows how the recent good rains has pushed the relevant dam levels up from being the worst of the six years to being the best for three years. 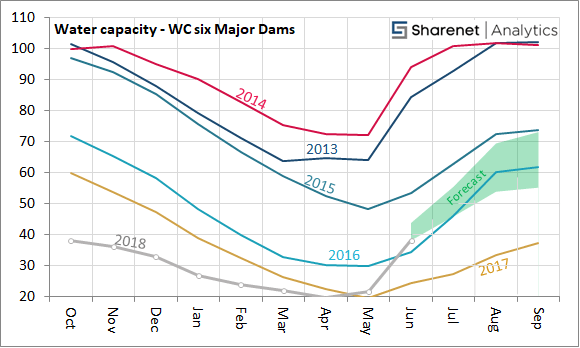 The sharp upturn is also reminiscent of 2013 and 2014 when the trend was continued beyond June (and as it happens to 100% of capacity in those years) The dams in question are not identified and are not necessarily the same as in Figure 1. If ‘major’ refers only to size and not necessarily to importance then Kwaggaskloof (170 million m3), Clanwilliam (123 million m3) and Brandvlei (286 million m3) would replace the Wemmershoek and Steenbras Dams. This is of some interest as the Kwaggaskloof is lower than a year ago. The better position is attributable to higher rainfall but this seems to have been patchy. In my last blog I referred to using Theewaterskloof figures as a proxy for the region now that Cape Town airport figures have been deemed unreliable. However the Theewaterskloof figures give little indication of the higher rainfall. The cumulative figures to 17 June for the four years 2015 to 2018 all lie within the surprisingly narrow range of 145 to 168mm and all well within the lower quartile of the 38 year figures. On the other hand going back to 2014 produces a figure of 339mm. By way of further contrast the comparative figure for Steenbras is 298mm this year compared to 153mm last year and at Zuurvlakte at the northern end of the Groot Winterhoek Wilderness Area this year is 480mm and last year 172mm. Last year’s uniformity, at least for these three locations, has thus been replaced by some large variations.